There is sufficient evidence to firmly engage in a process of fundamental reform of the international investment agreements (IIAs) and investor-State dispute settlement (ISDS) system. 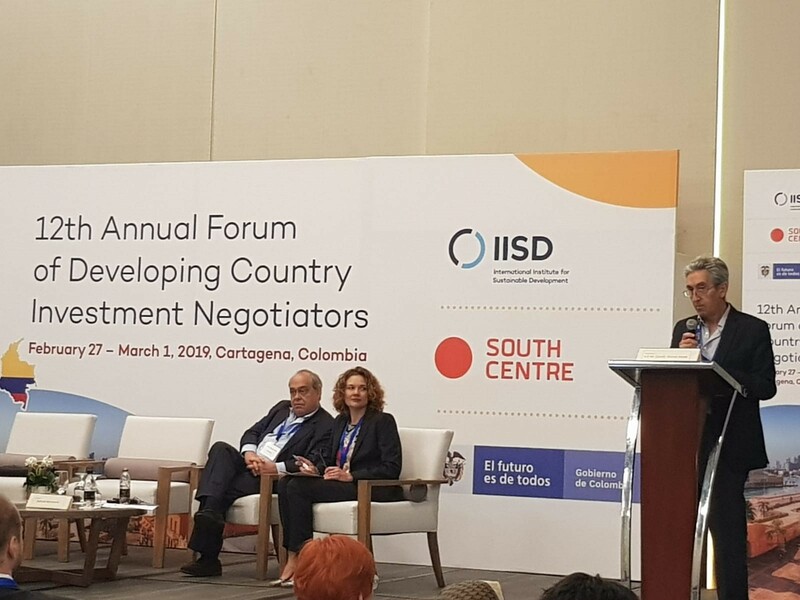 Developing countries’ negotiators and experts discuss the way forward during the 12th Annual Forum of Developing Country Investment Negotiators held in Cartagena, Colombia on 27 February-1 March 2019. The city of Cartagena hosted senior-level negotiators and experts from developing countries in the 12th Annual Forum of Developing Country Investment Negotiators. Jointly organized by the South Centre, the International Institute for Sustainable Development (IISD) and the Government of Colombia, the Forum served as a space to discuss the current trends and perspectives in regard to international investment agreements’ (IIAs) negotiations, policy-making, and the experiences from and lessons learned in different national and regional contexts that are relevant to the possible reform of the international investment regime. With a growing number of negotiated and concluded IIAs -3,339 by the end of 2018- both developing and developed countries have identified a number of problems and flaws, particularly emerging from their experiences in investor-State dispute settlement (ISDS) claims. In this context, the Forum focused on the challenges and opportunities developing countries face in bilateral, regional and multilateral negotiations, including the fora where reforms of the IIAs’ regime and the ISDS system are currently being discussed. Carlos Correa, Executive Director of the South Centre, reminded that a reform of IIAs and ISDS is necessary in light of the solid evidence available about the limitations and flaws of the regime as contained in numerous bilateral investment treaties and other IIAs of the so-called ‘1st generation’. Although the negotiation and conclusion of many IIAs were premised on the expectation that those agreements will attract foreign direct investment (FDI) to developing countries, empirical evidence has shown that there is no immediate correlation between IIAs and FDI. Moreover, IIAs are essentially unbalanced as they grant investors rights without imposing obligations. For instance, host States generally have no right to counterclaim for non-compliance of domestic law, misconduct or damages generated by the investor while conducting their business activities. Similarly, the rights given to foreign investors are not accorded to local investors who play a crucial role in development. In the same vein, IIAs provisions are generally based on ambiguous language, which allows for broad interpretations by ISDS tribunals such as of the definition of investment (including mere contracts or a trademark license as in the case of Bridgestone v. Panama), fair and equitable treatment (FET), most favored nation (MFN), indirect expropriation, among others. These provisions have been used to bring multibillion-dollar cases against States, which do not only affect the national budgets but can also prevent new legislation and other public policy measures from being adopted or applied. The exposure of States to ISDS, in effect, often generates a ‘chilling effect’ on regulatory processes, as States will be required to allocate large amounts of public funds and resources to defend themselves from such claims, and therefore States may be forced not to adopt new public policy measures in order to avoid the financial and legal risks emanating from ISDS claims. The possibility that IIAs give to investors to bypass the intervention of national judicial authorities by allowing them to directly submit a claim to ad-hoc arbitral tribunals, and the fact that States do not have a chance to ‘win’ any claim, but only not to be condemned to pay claimed damages to the investor, was also brought up during discussions on the need to reform the current IIAs and ISDS systems. For Carlos Correa, this evidence is sufficient to firmly engage in a process of fundamental reform of the IIAs and ISDS system, as the regime operates in isolation from and often in contradiction with the achievement of the sustainable development goals (SDGs) as contained in the 2030 Agenda for Sustainable Development. The 12th Annual Forum of Developing Country Investment Negotiators also focused on the challenges countries are facing as a result of the proliferation of fora addressing the proposed reform. Discussions considered the developments and efforts already made by developing countries in the reform processes at national and regional level, and how such experiences could orient the current processes of modernization of the International Centre for Settlement of Investment Disputes’ (ICSID) regulations and rules, as well as the discussions at the Working Group III of the United Nations Commission on International Trade Law (UNCITRAL). For Camilo Alberto Gómez Alzate, Director General of the Agencia Jurídica del Estado of Colombia [see here for Colombia’s statement on reform of investment protection agreements], this was a historic moment for developing countries to be heard and to develop joint positions to advance the changes that are required to improve the investment arbitration system. Developing countries should be at the forefront of this reform process in order to make IIAs a tool in support of the SDGs and facilitate successful linkages between FDI and national development objectives and priorities, particularly by creating capacities for sustainable development. Author: Daniel Uribe is Researcher of the Global Governance for Development Programme (GGDP) of the South Centre.